Upgrading your tiny hard drive to a spacious one expands your available memory. AOMEI Backupper is the most suitable tool to realize this function. Why upgrade your tiny hard drive to a spacious one? If you’ve bumped up against the limits of your small, old hard drive over and over, it may be the time to upgrade. In some instances, all the desktop user may need to do is install a second(or third) hard drive for a little more space. But that’s not always an option, especially for laptop users. So an effective solution to this problem is cloning your hard drive - complete with your operating system and all your data to a new, bigger - a spacious drive. To solve the question of insufficient memory, upgrading your tiny hard drive to a spacious one is essential for you. After the discussion above, we find that cloning your tiny hard drive to the spacious one is the effective solution of the problem. Now the question is which tool is the most suitable for cloning your hard drive. Via deeply research about clone software, on the first place, the best clone software should have the ideal clone function. Secondly, an well-designed user interface which is easy to understand is critical. And the cost of the clone software should be cost-effective, no matter in time, energy and money. Finally we find AOMEI Backupper is the best clone software which meets your urgent needs. AOMEI Backupper is a clone software which have all-inclusive clone services. And it is an easy to use software for even a new comer of clone software. That all depends on the intellectual user interface. Besides, you can realize upgrading your tiny hard drive to a spacious one without paying for it. So AOMEI Backupper is the best choice to cloning your tiny hard drive. How to upgrade your tiny hard drive to a spacious one using AOMEI Backupper? To upgrade your tiny hard drive to a spacious one is to cloning your tiny hard drive. Now let me show you the detail of this hard drive replacement. Step1. Download AOMEI Backupper Standard, install it. Plug the spacious hard drive into your computer using an available USB port. 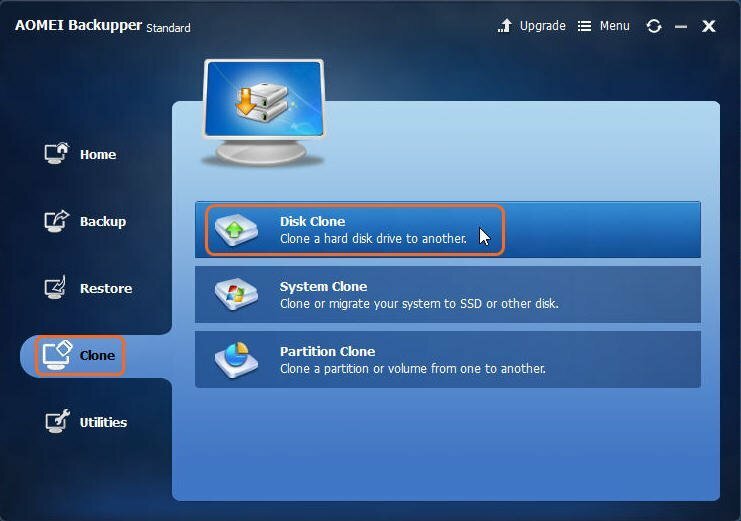 Launch AOMEI Backupper, click Disk Clone under the Clone option. Step2. Select the disk(Disk0) that you wish to clone. Then click Next. Step4. 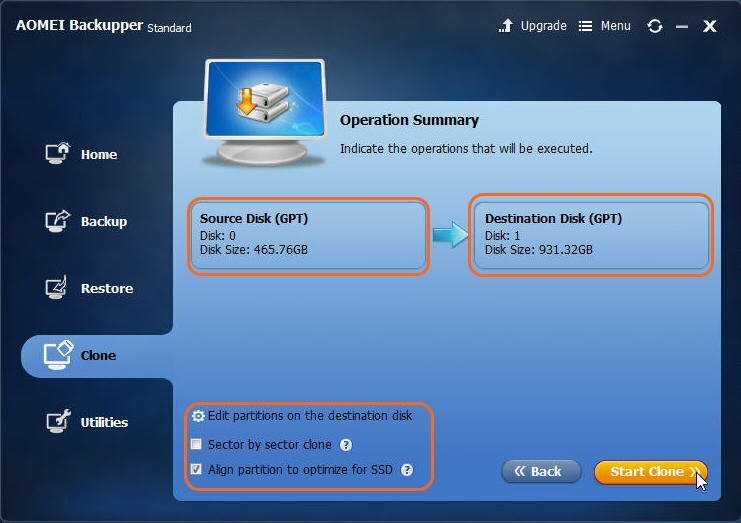 Confirm the settings in the Operation Summary which indicates the operations that will be executed. And then click Start Clone to begin the clone process. ■ In the left-bottom of the Operation Summary, you can see three options. You can set your clone detail there. ■ If the two drives are not the same kind of drive, you can use AOMEI Partition Assistant to do the convert.